***** These were hand enameled. Same verse as just above ▲, and the same “trophy” display at the bottom. 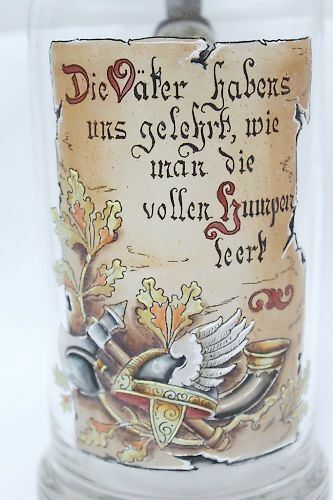 Detail of above decoration showing “Old German” attributes :The drinking horn, a winged helmet and a battle ax. 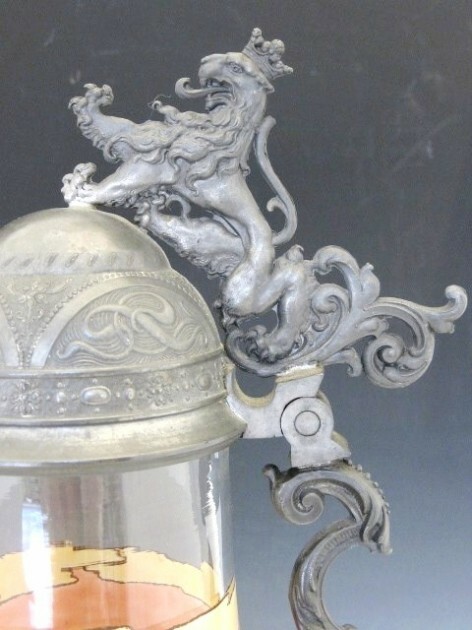 Detail of lid’s pewter work. 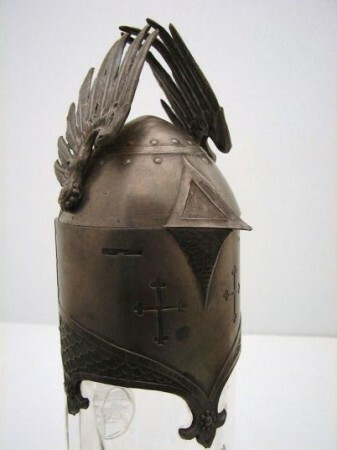 Unknown pewter maker. 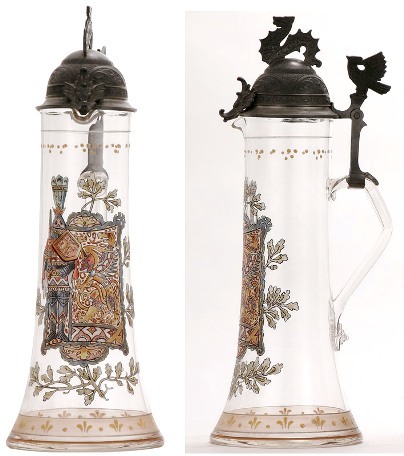 van Hauten either had his own pewter fabrication shop or he had a master pewterer such as Jos. Lichtinger in Munich, under contract with a stipulation that all the thumblift and cap designs would not be used elsewhere. 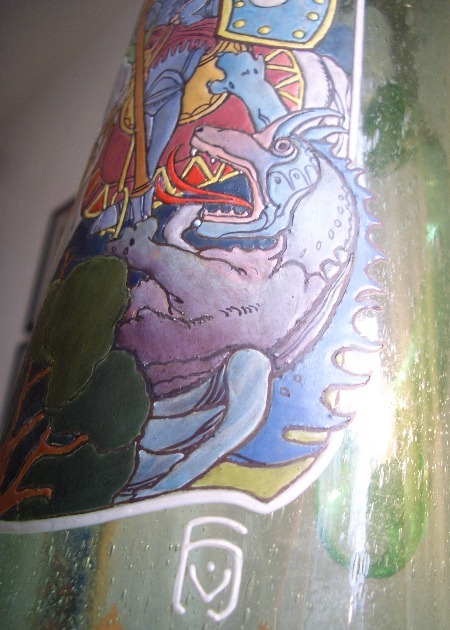 Another version of the same one liter blown glass mold as 5 above ▲, but a different scene. Same body style as above only done in a half liter size. 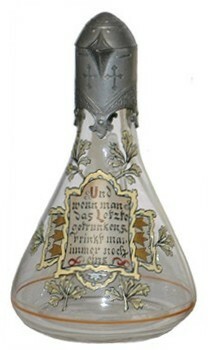 A one liter wine server. A very different type of decoration design. 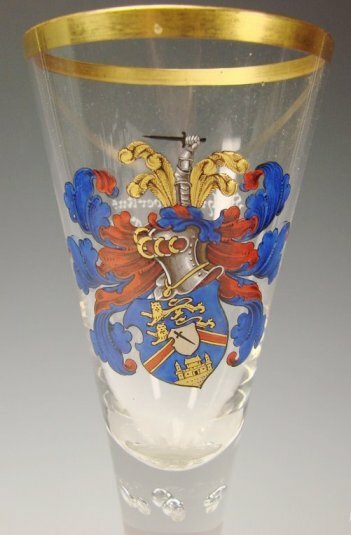 COATS OF ARMS (“NOT CRESTS!”) – NOT FAMILIES. 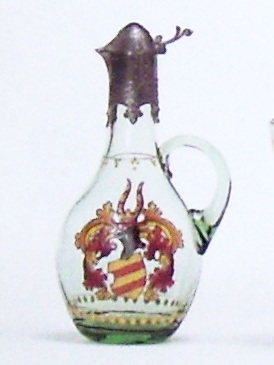 One liter blown glass, enameled by v-H, unknown Arms at present. 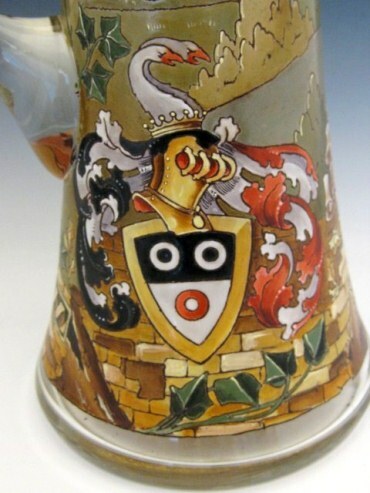 FAMILY “COATS OF ARMS” ON V & B METTLACH BLANK STEINS. 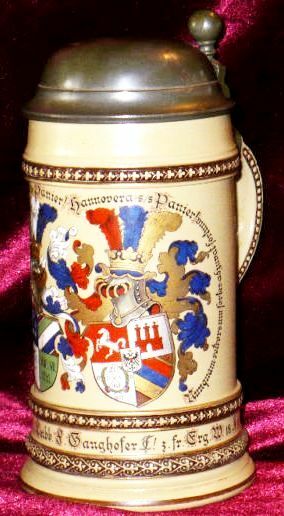 A friend of mine “stole” this one off eBay in early 2011- Dual dueling societies’ coat’s of arms on a stein are very, very collectible! 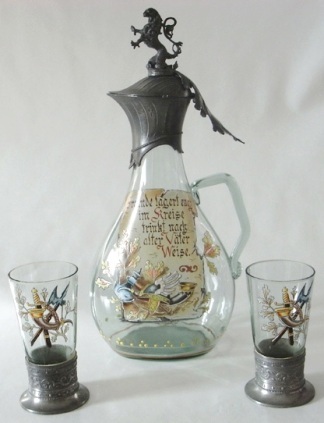 Not to mention it was decorated by van Hauten’s shop, and the stein’s body was made by V & B Mettlach. Below: Mark on bottom. 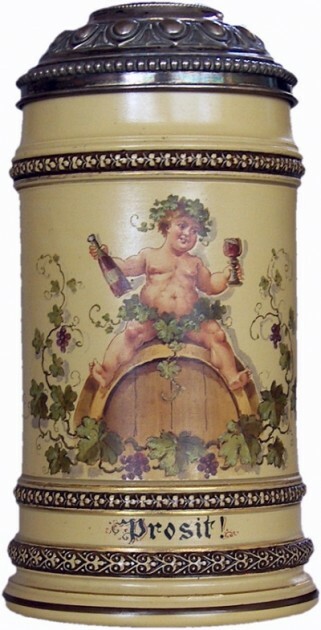 I think this lid is painted gold and not gilded. 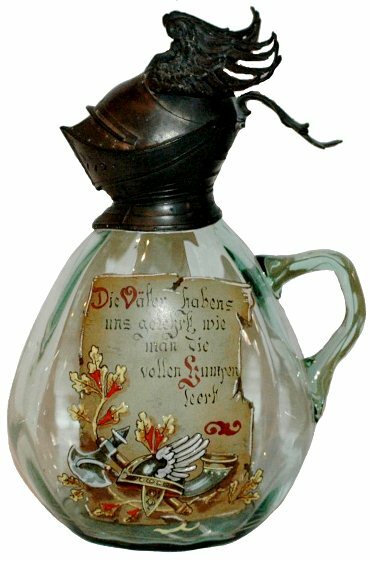 A “van Hauten,” smaller server, painted for the Corps Teutonia, one of many 100’s ofGerman dueling societies. On a V & B Mettlach, .5L, No 284. 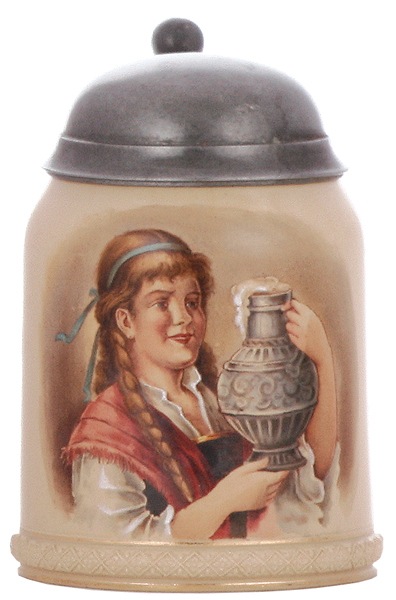 A “kegels stein.” A V & B Mettlach #280, hand painted [?] and signed by van Hauten. An almost matching server to the beaker just above it. 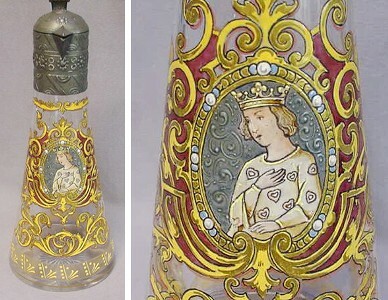 The glass color is probably the same (the standard yellow green for a TH piece), the difference is probably in the photo. A “Roman” soldier on a “Roemer”!! 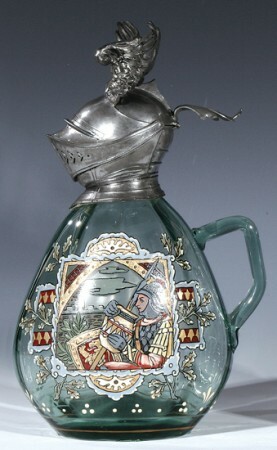 A blown glass Roemer, with scene of plumbed knight, holding a pendant. 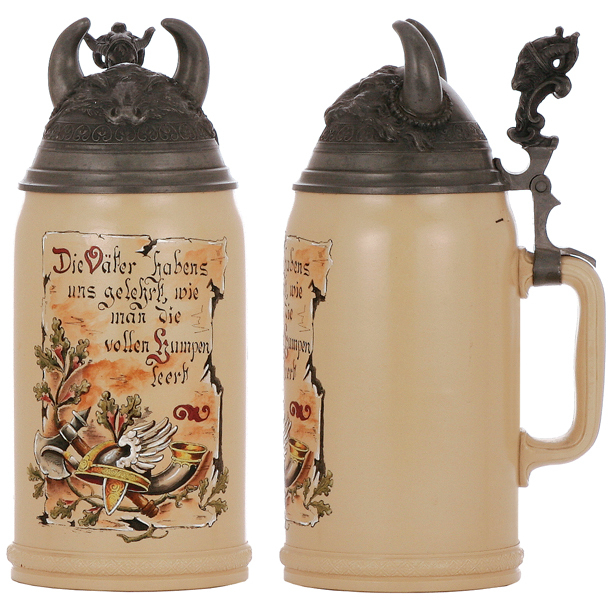 Very close in design to one of the larger Medieval figure series beer servers shown below, starting about 10 photos down. 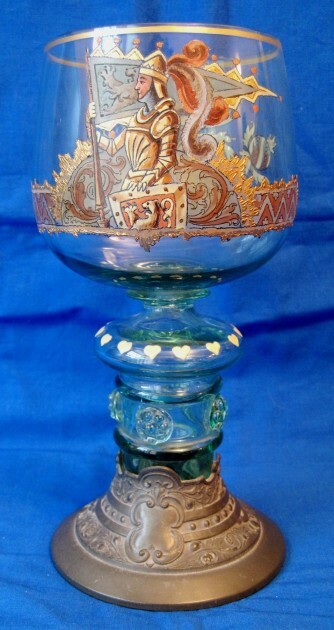 An interesting pokal, I wish I had better photos to work with. 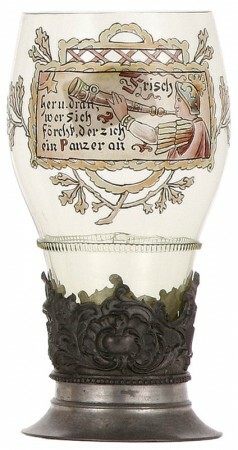 Details of the above pokal. 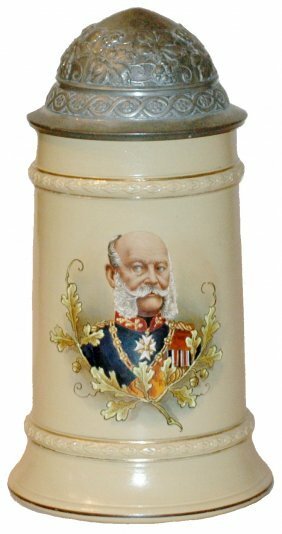 The German Kaiser William I. 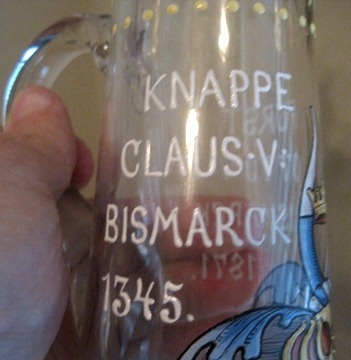 Really close to Bismark’s Coat of Arms. 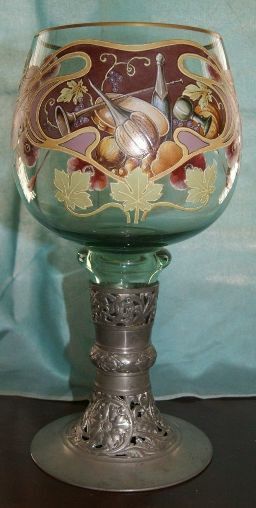 Rounded glass handle. MEDIEVAL COURTLY FIGURES – WITH EXCELLENT PEWTER WORK BY AN UNKNOWN PEWTER SMITH. 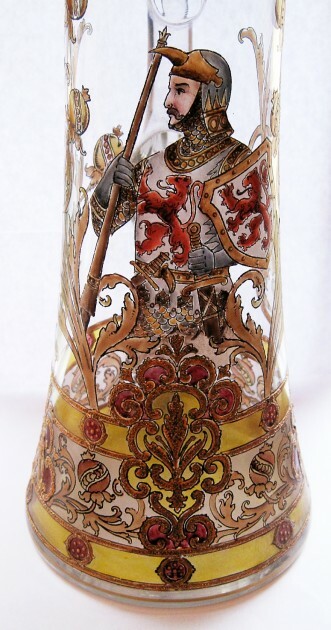 And another, knight with a sword and shield. 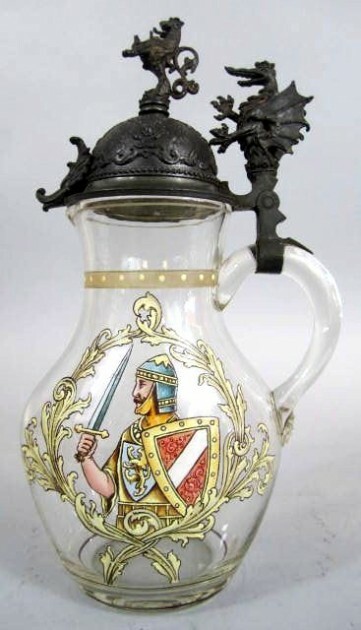 Rounded glass handle. 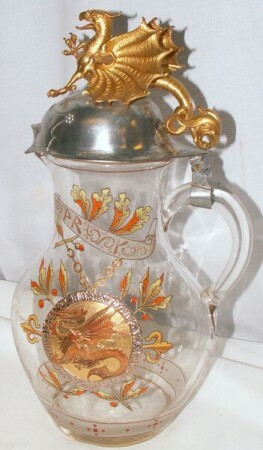 Fancy griffin (dragon ?) 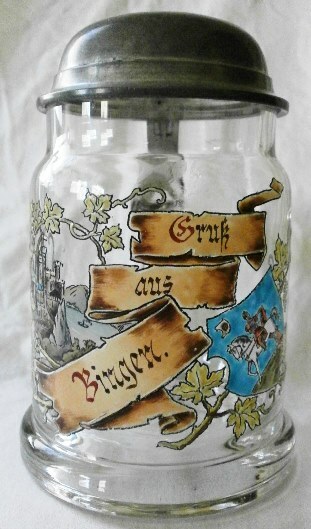 design with an interlaced scroll, very similar to Scandinavian artwork. A very young looking king or just royalty. I am assuming this is a queen. Unknown Arms. 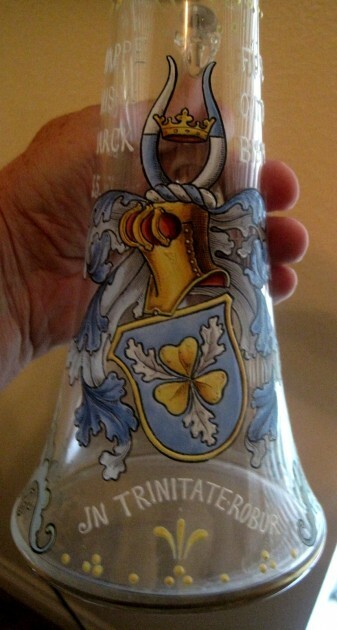 Detail of above ▲: knight with spiked spear, and Bohemia’s Coat of Arms .Rounded glass handle. 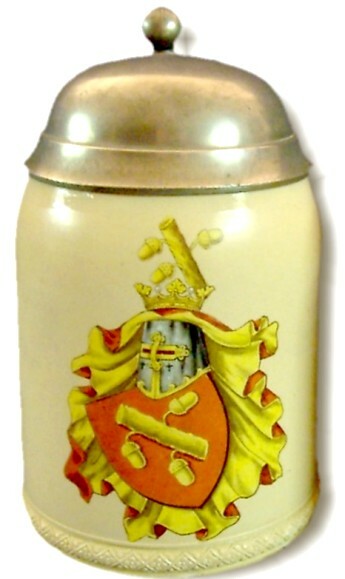 Knight holding his Lord’s flag/ pendent. Squared glass handle with button finial. There is a bit of artistic license for this scene. 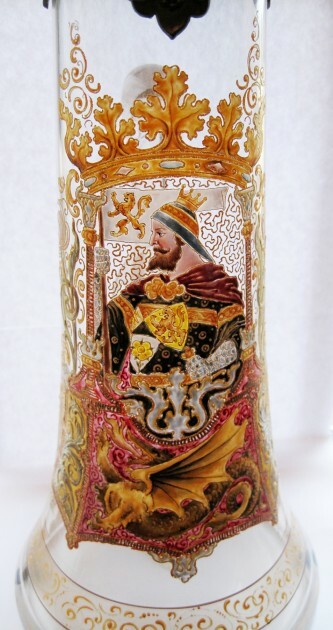 Shows a crowned royal male / a king [?] holding his own standard! With a single griffin wing and foot below. 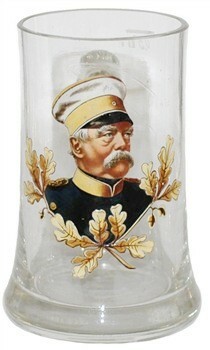 Rounded glass handle. 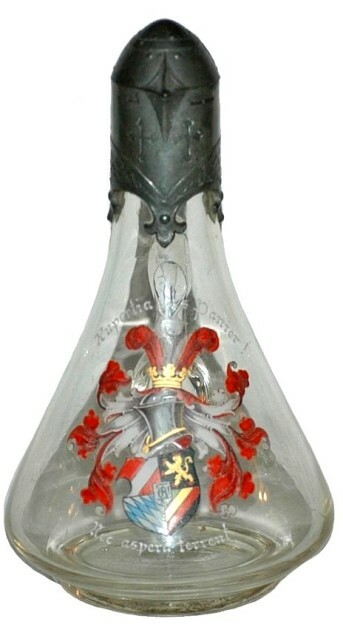 Detail: This one has a very weird looking plumbed knight holding a sheathed sword [!] and shield. The large panel to the viewer’s right shows another Griffin with a very elongated neck and body . Similar to just above ▲ – but with a different finial on the lid and a different thumblift. 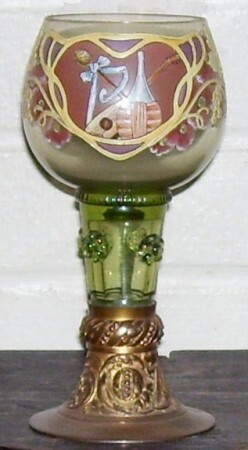 Squared glass handle with button finial. 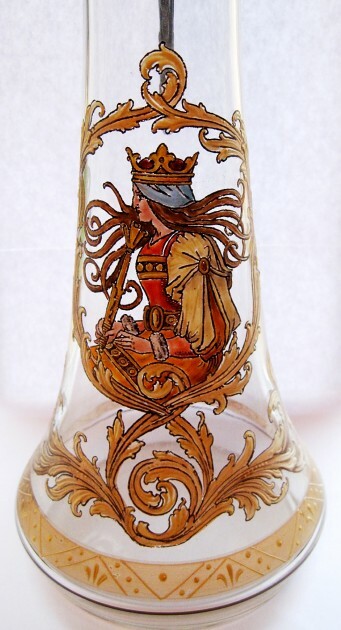 Detail: A queen holding her scepter. 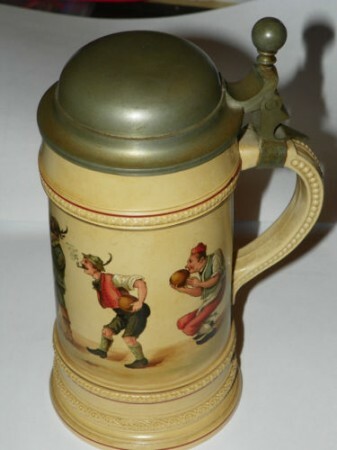 With a metal handle! 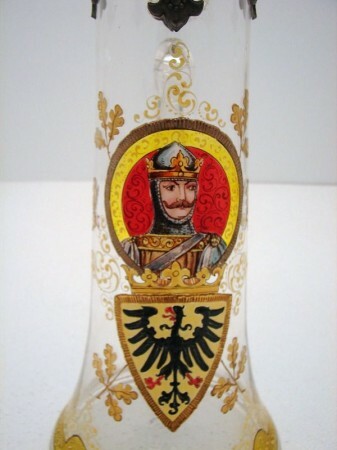 A crowned king’s portrait shown just above the old Imperial German spread winged adler, as the Arms. 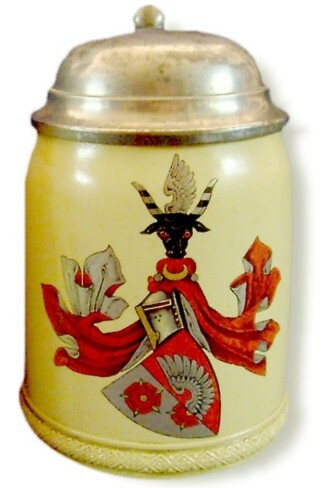 Details of the feathered helmet on the stein just above. 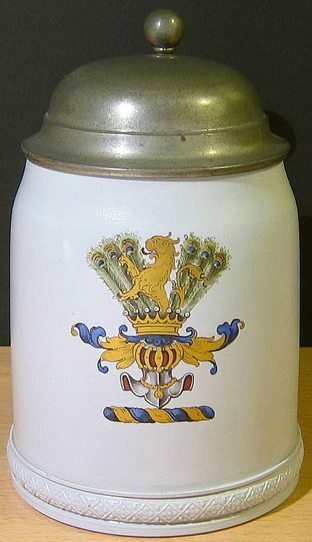 Another different crowned king’s portrait shown just above the spread winged Prussian Eagle as the Arms. 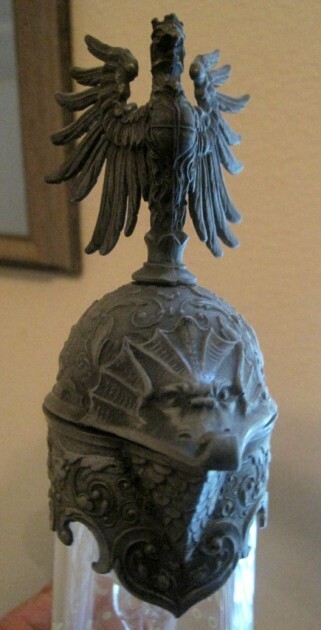 Unusual pewter cap with what I thought surely was a Cockatrice given all the other exotic heads produced by this firm. A cockatrice is a mythical beast, a two-legged dragon with a rooster’s head. 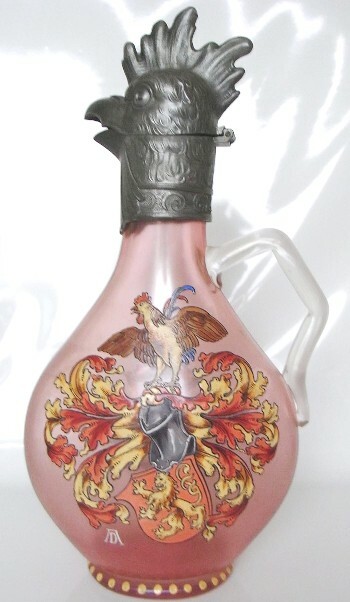 But given what is shown on the Crest of these Arms it may just be a damned old rooster. I’m thinking Cockatrice on this head anyway, a mean looking, beak ! 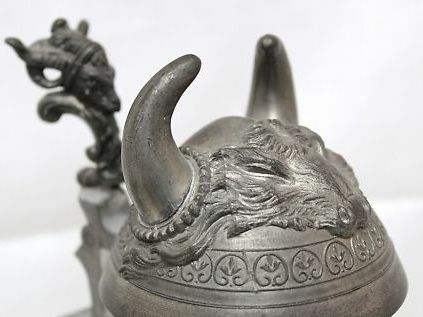 Detail of the unknown pewter master’s rampant lion and the adaptive way the handle to hinge attachment was made ! 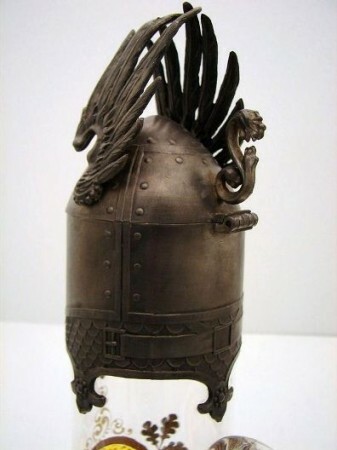 13 inches tall server of St. George and his dragon by van Hauten. A very different body design. Just about “The Mother of All Lids!” Painting done by van Hauten. 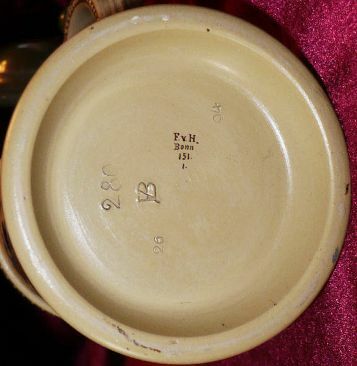 Unknown pewter lid maker and this one may be gilded and not paint. Circa 1890. Very scarce.